What is the qi definition or definition of qi? The definition of qi can be explained like this. Qi exists in everything that is vegetable, animal, mineral, earth, water, sky and fire. It is universal. Qi is pronounced chee in Chinese, in Korean it is gi; Japanese ki; and Vietnamese khí. It plays a very important part in traditional Chinese medicine and martial arts. Bu tong ze tong, tong ze bu tong, means, free flow: no pain, no free flow: pain. The definition of qi can be seen in these examples. Rain falls to the earth then the sun shines. As a result the garden is nourished. We can then eat the produce. The qi is then transferred to us. From the flint the qi energy, is transmitted to the wood making fire. The wood burns, the qi in the fire makes heat to boil up water and cook the food. Heat is named heat Qi or (Re Qi). The weather is named Heaven Qi or (Tian Qi) this is because it shows the energy state of the heavens. When someone is honorable and has spiritual power to do good, they have Righteous Qi or Normal Qi (Zheng Qi). If a person is living, their body's energy is known as Human Qi or (Ren Qi). 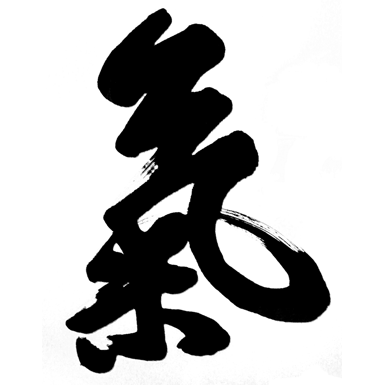 Qi also expresses the energy state of something, especially of living things. when something is dead it has Si Qi ,(Dead Qi) or Ghost Qi , (Gui Qi). The morale or spiritual state of a army is called (Qi Shi) or Energy State. The concept of life-energy innate in all living thing can be seen in other ancient religions and other metaphysical systems. A list is shown below.